I love our house, but there are some weird features that I've had to get creative with - like the corner windows. They're kinda cool. I like the light. But there is no casing or architecture to frame them, leaving them looking sort of bare. In the boys room and guest room, it's fine. The faux wood blinds are masculine and go with the rooms. But in Laurie's room, I thought the windows needed something cheery. They are the first thing your eye goes to when you walk by or enter the room. 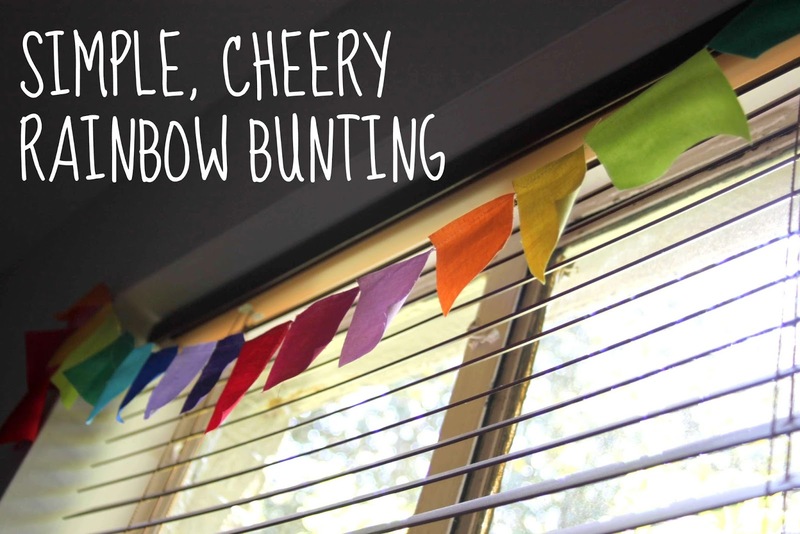 I decided on a this colorful flag bunting. I wanted something inexpensive and temporary. We are very much in a phase where we are switching up rooms a lot. In a year or so, the new baby will probably join Laurie in her room. Or who knows. Maybe not. We may do fruit basket turnover and completely switch everybody and every room up. I was not ready to commit to curtains. My inspiration came from WHATEVER the shop. This project was so simple, easy, and quick. Cut rough squares or rectangles. Sew a continuous thread to connect them all together...using a sewing machine, of course. We hung it using little, white hooks like these. I love decorating kid spaces. Here is one of my favorite interweb kid bedrooms on Oh Happy Day. I think it's great how the sophisticated rug is mixed in with toddler beds, toys, and books!